Just 7 miles from central London, 3 Mills Studios is one of the most accessible Studios in the UK. 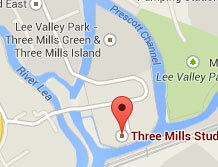 Our excellent transport links to the motorways and international airports make getting to 3 Mills Studios very easy. You can get to us by public transport, bicycle or vehicle. Hunt’s Lane, London, E15 2QD. Please see the relevant news article for further information. Parking availability for audience members who are Blue Badge Holders is wholly at the discretion of the respective production company. Subject to approval by the production company, 3 Mills’ management will endeavour to provide suitable parking onsite for Blue Badge holders only. Parking cannot be guaranteed and must be arranged in advance by contacting info@3mills.com or reception on +442082153330 to make inquiries. You should be aware that the entrance to 3 Mills Studios is cobbled which may cause problems for wheelchair users or those with walking aids. Neighbouring Tesco Bromley-by-Bow has a camera controlled car park with a strict 3 hour time limit and fines for overstaying or incorrect use. Audience parking here is at the individuals discretion, is not recommended by 3 Mills Studios and we cannot be held liable for any vehicle parked on this site.